First Day Jitters (Mrs. Hartwell's Classroom Adventures #1) (Paperback) | Let's Play Books! Everyone knows that sinking feeling in the pit of the stomach just before diving into a new situation. Sarah Jane Hartwell is scared and doesn't want to start over at a new school. She doesn't know anybody, and nobody knows her. It will be awful. She just knows it. With much prodding from Mr. Hartwell, Sarah Jane reluctantly pulls herself together and goes to school. She is quickly befriended by Mrs. Burton, who helps smooth her jittery transition. This charming and familiar story will delight readers with its surprise ending. Fun, energetic illustrations brighten page after page with the busy antics surrounding Sarah Jane. 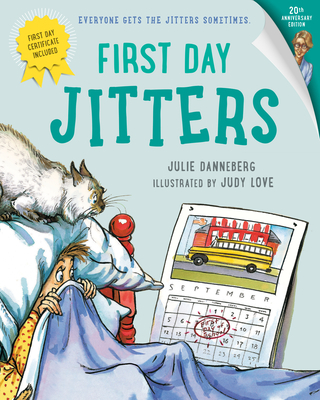 FIRST DAY JITTERS is an enchanting story that is sure to be treasured by anyone who has ever anticipated a first day of school. As a kid, when Julie Danneberg daydreamed or played at being grown-up, she never imagined herself as a writer. Instead she dreamed of being a famous girl reporter, a secret agent, and a teacher. Julie Danneberg is the author of several books for children, including FIRST DAY JITTERS, FIRST YEAR LETTERS, LAST DAY BLUES, COWBOY SLIM, and FAMILY REMINDERS. She lives in Denver, Colorado.